Still great after all these years! 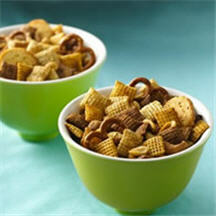 Chex® Party Mix has been a party favorite since the 1960's. In ungreased large roasting pan, melt butter in oven. Stir in seasonings. Gradually stir in remaining ingredients until evenly coated. The original recipe includes Corn Chex®, Rice Chex® and Wheat Chex®. You can mix and match to suit your taste--just use a total of 9 cups of cereal. To reduce the fat to 2 grams and the calories to 80 per serving, use 3 tablespoons margarine instead of the 6 tablespoons butter, omit mixed nuts and use fat-free bagel chips. Make enough of this favorite mix to package up as gifts for special friends--it’s so good and always a welcome surprise. Recipe and photograph provided courtesy of www.chex.com, through ECES, Inc., Electronic Color Editorial Services.